Michigan Pheasants Forever honored two Department of Natural Resources staff members at the Pheasants Forever State Convention in Lansing Jan. 12. 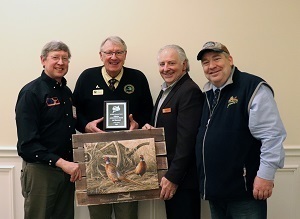 DNR Wildlife Division conservation partners program specialist Mike Parker was presented with the Michigan Pheasants Forever Partner of the Year award. Parker was nominated for the award for being an active member of the Michigan Pheasant Restoration Initiative steering committee and leading its Habitat Task Group. Parker provides leadership to many involved with the initiative, including DNR staff, Farm Bill biologists and Michigan United Conservation Clubs cooperative coordinator Morgan Warda. “Parker has successfully applied for federal grants to help accomplish the MPRI mission in Michigan, including a grassland grant, pollinator grant, and the Voluntary Public Access Program grant that funds Michigan’s Hunting Access Program,” said Michigan Pheasants Forever regional representative, Bill Vander Zouwen. This past year, Parker’s leadership was essential to development of the Pheasant and Monarch Conservation Reserve Program State for Wildlife Enhancement proposal that was approved by the U.S. Department of Agriculture for 40,000 acres and $61 million. Parker also advocates for MPRI interests in the Midwest and national interagency private-lands working groups. Also at the convention, DNR upland gamebird specialist Al Stewart was honored with the first Michigan Pheasants Forever Lifetime Service Award. 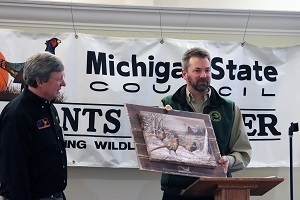 Stewart’s career has spanned well over four decades in Michigan wildlife management. He has been the state’s upland gamebird specialist for close to 20 years, and before that, worked as a wildlife biologist in southern Michigan. Stewart has been a strong supporter of Pheasants Forever, working at the organization’s National Youth Leadership Council training meeting in Michigan, contributing greatly to its success. He also has been working closely with Pheasants Forever on oversight of the Enbridge Fund and the Adopt-A-Game-Area program. In addition, Stewart has been a leader on the national stage, serving on the National Pheasant Committee and helping to write the national pheasant plan. His knowledge of woodcock management has also been sought in Europe, where he was recently a guest of Prince Charles. “We are so proud of both men and are remarkably lucky to have their passion and expertise in the Wildlife Division,” said DNR Wildlife Division Chief Russ Mason. The Michigan Pheasant Restoration Initiative is a conservation initiative to restore and enhance Michigan pheasant habitat, populations, and hunting opportunities on private and public lands. The initiative works by acquiring state and federal resources to assist landowners in to improve wildlife habitat on their properties and by improving habitat on selected state game areas, recreation areas, or other public lands. Learn more at michigan.gov/pheasant. Accompanying photos are available below for download. Caption information follows. Parker award: DNR Wildlife Division conservation partners program specialist Mike Parker (right) receives his award from Michigan Pheasants Forever regional representative Bill Vander Zouwen. Stewart award: Pictured left to right: Michigan Pheasants Forever regional representative Bill Vander Zouwen, DNR upland game bird specialist Al Stewart, Pheasants Forever national President and CEO Howard Vincent and Michigan Pheasants Forever State Council Chair Dan McMaster.